Club membership card helps business owners enhance their professional image for their clubs or organizations, make lasting impression with their members and the most important thing: increase sales! A standard club membership cards system contains three major elements: club membership cards, card making and membership data enrollment/management and card verification. Together with magnetic stripe technology, which enhance the security of the system and the provide convenience while verifying the validation of cards. Now with the new version of ID Card Workshop, you can easily create your own magnetic stripe club membership cards system. 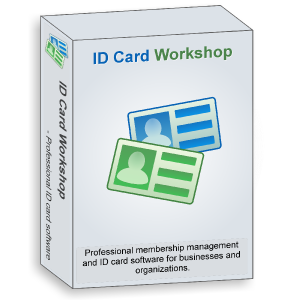 ID Card Workshop supports magnetic stripe id card printers for printing and use magnetic stripe readers(with keyboard interface) to reading data(such as id number etc) from cards for verification and membership record searching. To create club membership cards, you can simply create from existing templates and then modify the design or you can create projects from existing databases such as Access(*.mdb/*.accdb), Excel(*.xls/*.xlsx) and SQL based(MS-SQL,MY-SQL etc. ), or you may also create a blank project. After the project created, use its in-built membership enrollment features to enroll new members. And then use printing feature to output the club membership cards. the software supports ID card printers, laser printers and inkjet printers for printing club membership cards. Verify the validation of issued cards is easy in ID Card Workshop, you can use records seeker feature to find the matched records to verify the validation. This feature allows users use magnetic stripe readers(with keyboard interface) or barcode scanners to read data from barcode or magnetic stripe, or you may also simply type the id number, name to find the matched records. Enables you to use webcams, digital cameras(Canon EOS series),files and scanners as image source to import/capture images while issuing photo id cards.